Wow, what a nice sweet rise from the Aussie! It’s a pity I’m not in this trade because I cancelled my orders just before the release of the NFP report. I’m a bit bummed out (again!) that I wasn’t able to ride that AUDUSD uptrend. Just after I closed my open orders, the price dipped to a low of .9709 before coming close to my first profit target. Argh! Then again, I did plan to sit on the sidelines during the release of the NFP report since I wasn’t prepared to handle the extra volatility. Besides, the pair made a new high after I put up my Fibs. That means my retracement idea was already invalidated and I probably should’ve adjusted my entry instead. Hmm… My sweet tooth’s tingling. Gosh, I hope it isn’t a cavity! Then again, it could be AUDUSD telling me to go long! If you ask me, the pair has nowhere to go but up, especially since the discrepancy between Australia’s fundamentals and the U.S.’s seems larger than ever now. Just this morning, Australia revealed that it more than doubled the expected number of new jobs in September. And the fact that the RBA decided to hold rates in its last interest rate decision shouldn’t hold the Aussie back too much either. Many say we’ll probably still see a rate hike by the end of the year. The U.S., on the other hand, appears more likely to take on further easing now that its ADP employment survey reported surprising job losses. 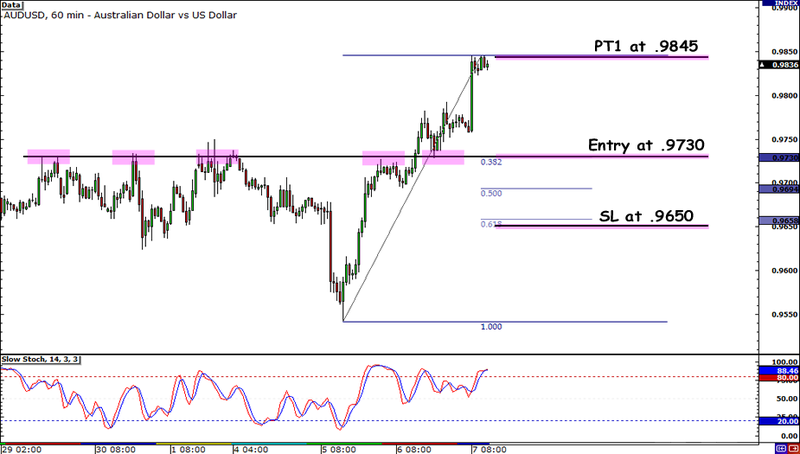 Looking at the 1-hour chart, I noticed that there was a former resistance area around .9730. The pair could pull back to that level before continuing its uptrend. That’s pretty near the week open price too, which means that it could serve as strong support. I’ll be targeting the recent high as my first PT then I’ll let the rest of the trade ride. Who knows, Aussie dollar could reach parity with the Greenback! Long AUDUSD at .9730, stop loss at .9650, pt1 at .9845. I’ll let the second half of my position ride after I hit my first PT but I’ll move my stop to breakeven. Wish me luck!